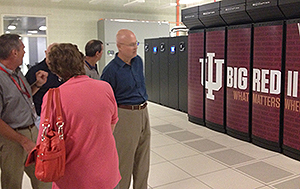 Bloomington Press Club members saw the state-of-the-art IU Cyberinfrastructure Building and nearby Data Center during a tour of the facilities June 24. In addition to serving as the location of some of the university’s most innovative technical work, the Cyberinfrastructure Building is the “greenest” building on campus and is certified as LEED (Leadership in Energy and Environmental Design, the government’s certification for sustainable construction). Many of IU’s technical department staffs collaborate under one roof. The Data Center is where most IU computers are stored, including Big Red II, one of the most powerful university computers in the world. It is 25 times faster than its predecessor and will enable researchers to carry out their work more efficiently, according to IU’s press release issued when Big Red II was dedicated in April. The Data Center is mostly underground with no windows and tight security. Dan Miller, vice-president for information technology, led the tour of the building, which was constructed in concrete that should be safe even in an F5 tornado. This entry was posted on Friday, June 28th, 2013 at 12:07 pm and is filed under Guest speakers. You can follow any responses to this entry through the RSS 2.0 feed. Both comments and pings are currently closed.